Charge your devices safely with the PowerCore 20,000mAh 2-Port Portable Power Pack from ANKER. This 20,000mAh battery can charge up to two devices at the same time, providing Quick Charge 3.0 compatibility that's capable of providing up to 3A of power across both devices for fast and easy charging. When you need to recharge this power bank, you can do so with its included micro-USB cable and a 2A power input. Moreover, you get to keep any on your PowerCore's charging status with its built-in power indicator lights. 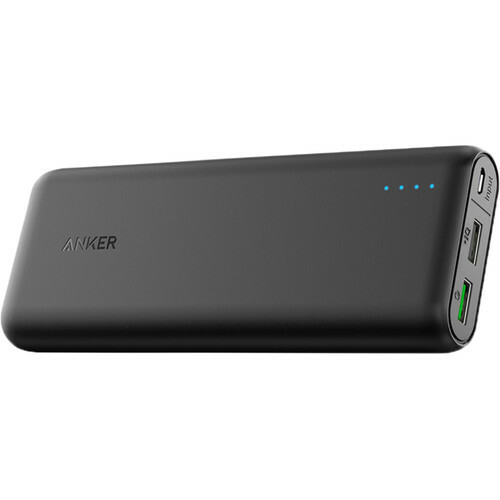 The ANKER PowerCore 20,000mAh 2-Port Portable Power Pack can charge two USB devices at the same time. This portable charger has four indicator lights that signal the status of the battery's charge. Box Dimensions (LxWxH) 8.0 x 6.0 x 2.0"